For most summer has quickly come to an end or will be ending soon. Here, schools won’t start for another week and Labor Day (the unofficial end of summer) is hoovering on the horizon. In fact, all around me I am seeing fall and Halloween decor, recipes and even a whisper of cooler temperatures. And while I normally embrace the fall season (it is my favorite after all), I just can’t let summer go. I haven’t had enough lazy days lounging by the pool. I haven’t crossed off all the books on my summer reading list. And I just went on my first summer adventure and have one more summer trip planned. I almost feel like my summer is just beginning and everyone and everything around me says summer must come to an end. Well in my desire to prolong the lazy, hazy days of summer, I am kicking off my annual Ice Cream Week! Ice cream week is my second favorite themed week (second to S’mores Week) that I host. In years past I have hosted Ice Cream Week in July (fitting since July is National Ice Cream Month), however, due to computer problems and then camera problems, I only got half of the recipes photographed. But now I am back in action, ready to share some insanely delicious frozen treats! First up a dairy free, egg free, no ice cream machine required, 5 ingredient ice cream! Now this is an ice cream perfect for celebrating summer! You may even drift into a fantastic dream… imagining yourself on a white sand beach as you enjoy each bite. Summer is still here! Alive and well! 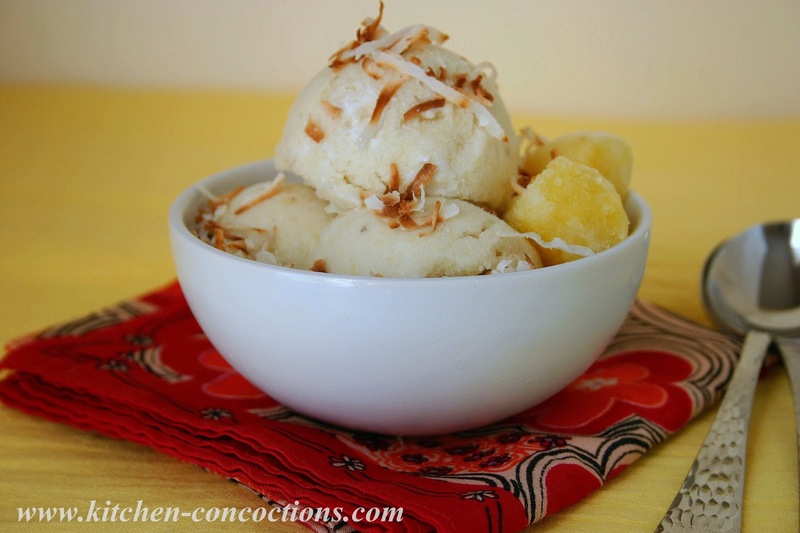 An easy, dairy free ice cream that mimics the flavors of the popular frozen drink, Pina Colada. In a high power blender or food processor, blend bananas, pineapple and coconut milk until smooth. Add additional coconut milk, if needed, to reach a smooth consistency. Pour fruit puree into a large freezer safe container. Pour cream of coconut into a large bowl (add extract if using). Using an electric mixer, whisk cream of coconut until medium peaks form. Slowly fold whipped cream of coconut into pureed fruit; folding until well combined. Cover and freeze for at least 6 to 8 hours or until firm. After firm place a sheet of plastic wrap directly on ice cream (to prevent freezer burn) and place lid on top. Return to freezer until ready to serve. 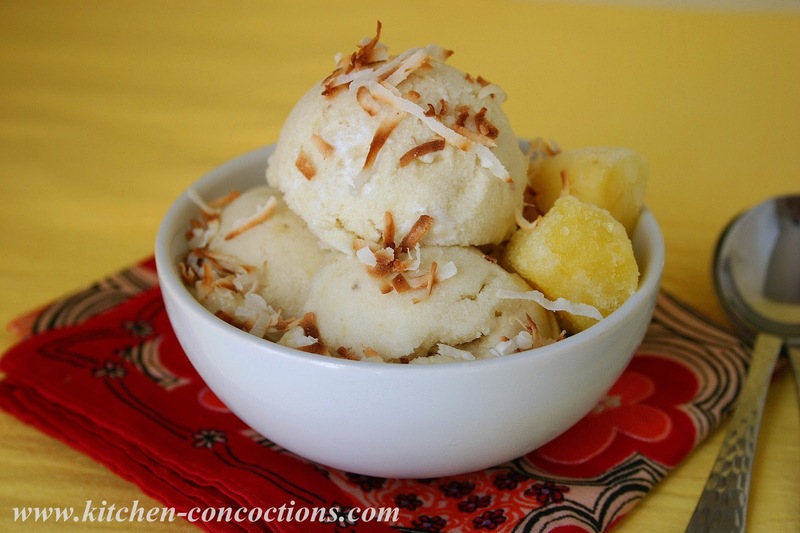 Serve topped with toasted coconut or fresh pineapple if desired.